If I had to do life over again, I may have followed the Bundesliga instead of the EPL. Doesn’t address supporting my own domestic league, but that’s a discussion for a different day. Incredible teams, passionate fan support and amazing players. 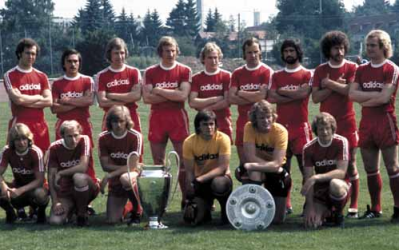 Historically Bayern Munich are the top dogs and from what I knew, they had always worn red home shirts, hence the name Die Roten. But one day I read this post from Museum of Jerseys, clicked on a link and my mind was blown. After two seasons the Bavarians changed to a white shirt with black shorts, and following a merger with Münchner Sport-Club (MSC) in 1906, the club changed to a strip of a white shirt and maroon shorts and this combo lasted until 1927 except for a short interval featuring a shirt with light blue and maroon stripes from 1909 to 1912. The 1927/28 season saw the introduction of a white and maroon striped shirt with maroon shorts which morphed into a white shirt with maroon sleeves and maroon shorts that was worn from 1931 to 1955. Looks fantastic. A kit of a maroon shirt and black shorts took over for two seasons before 1957/58 saw the return of white, with either a mostly white shirt or a white shirt with maroon sleeves, both worn with maroon shorts. In 1968 everything changed. 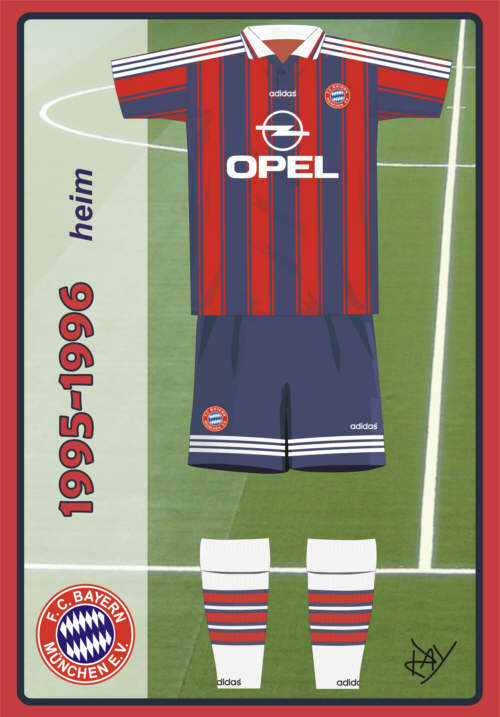 For one season the German club wore blue and red vertical stripes with blue shorts. It was an echo of the kits used from 1909 to 1912 and very similar to Barca’s strip. 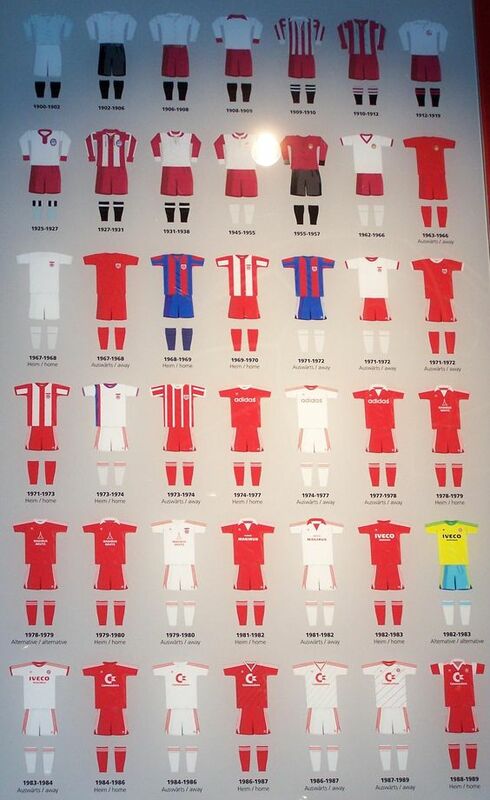 The following seasons of 1969-1973 saw a red and white shirt with red shorts (white shorts in 1970/71). The trefoil and three stripes of adidas were added to the shorts in 1971. Another one off shirt was worn in 1973/74 as the Reds wore a white shirt with a thin horizontal stripe of red and blue opposite the club badge with white shorts. In 1974 the club adopted the rich red shirt that I associate with the club. That year also saw the adidas logo appear on the shirt with the wordmark across the chest, the trefoil opposite the club badge, and the three stripes down the sleeves. 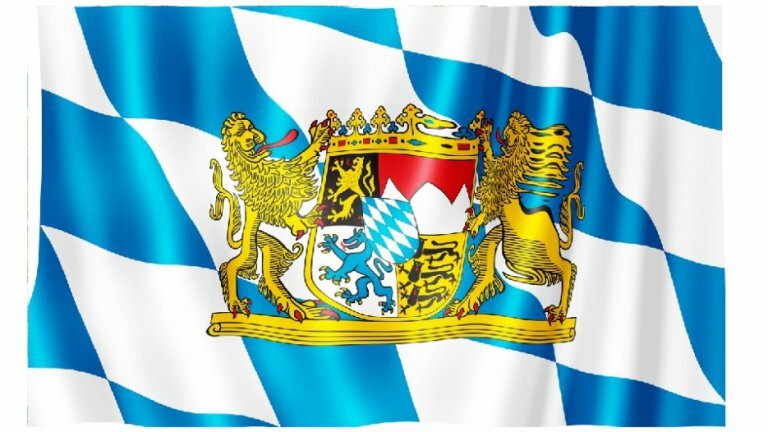 As far as I can tell adidas and Bayern Munich have the longest running partnership between manufacturer and club, and adidas even picked up a small percentage of shares in the club in 2002. An all red strip with varying design elements was worn until 1991 with an all white strip in 1977/78 being the outlier. 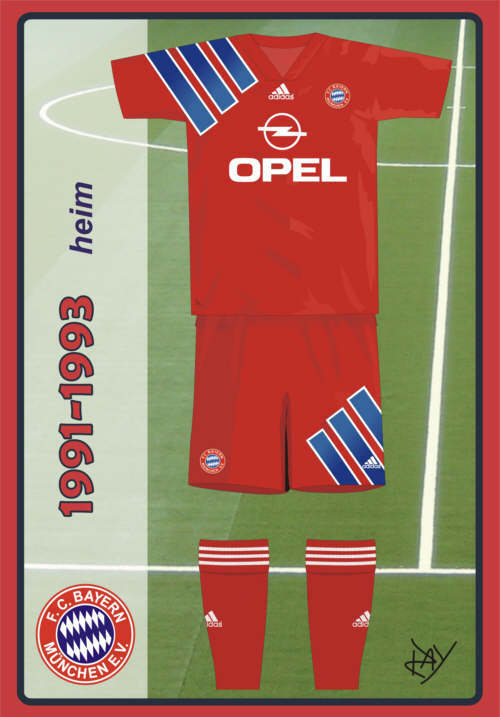 1991 saw the emergence of the adidas Equipment branding and the use of blue on Bayern shirts for the first time in 20 years. Three diagonal bars were seen on the shoulder opposite the crest and on the shorts. 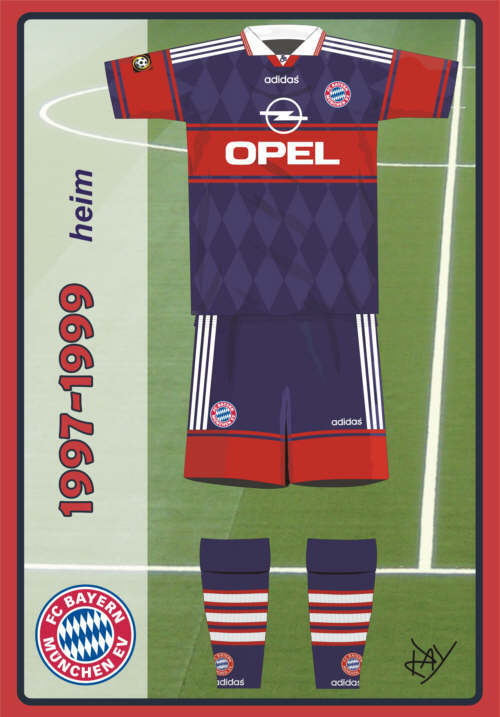 For the 1993/94 and 1994/95 season, things went one step further with the same template and the addition of blue sleeves. 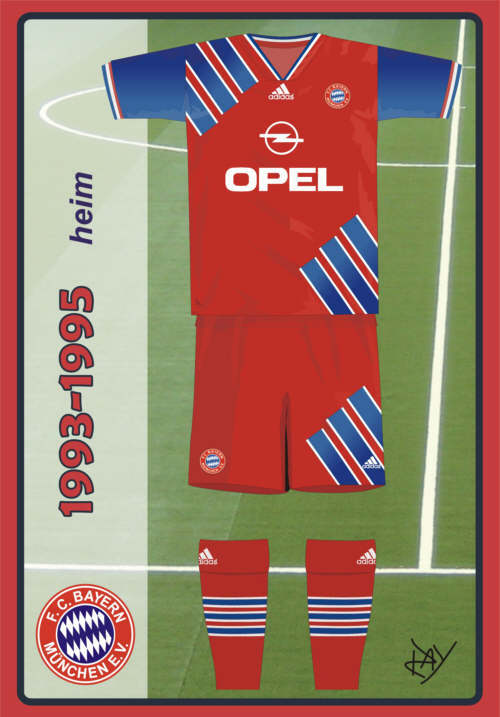 In 1995, the red/blue vertical stripes re-appeared with a white collar. 1997 saw the first predominantly blue jersey since the original days of the club and in a much darker hue. Big red bands broke up the navy blue diamond shadow pattern. The 1999/00 season saw red return as the main color, although the shirts for the 2001/02 and 2002/03 seasons were more of the historic maroon with charcoal sleeves and shorts. Horizontal red and white stripes got a look from 2007 to 2009. The stripes went vertical for the 2010/11 season in homage to shirts from the early 70s. 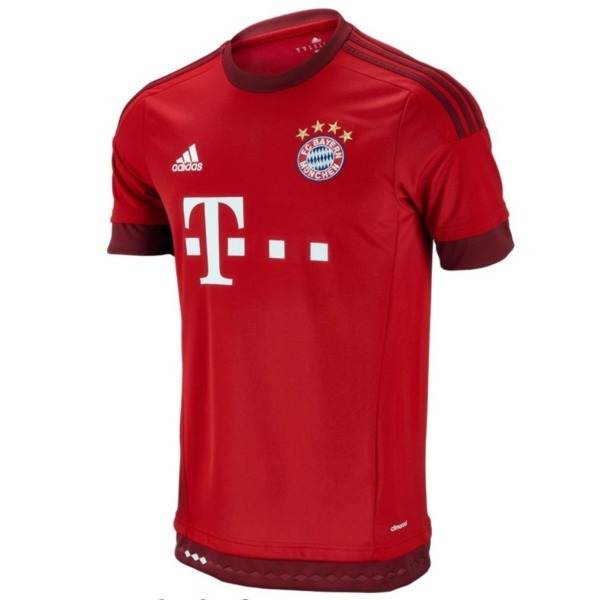 For the 2011/12 and 2012/13 seasons, Die Roten wore an all red kit with gold trim. This looks really good and is one of favorites. White replaced gold the following season and adidas added a diamond shadow print, similar to the crest in the body of the shirt for another really nice design. 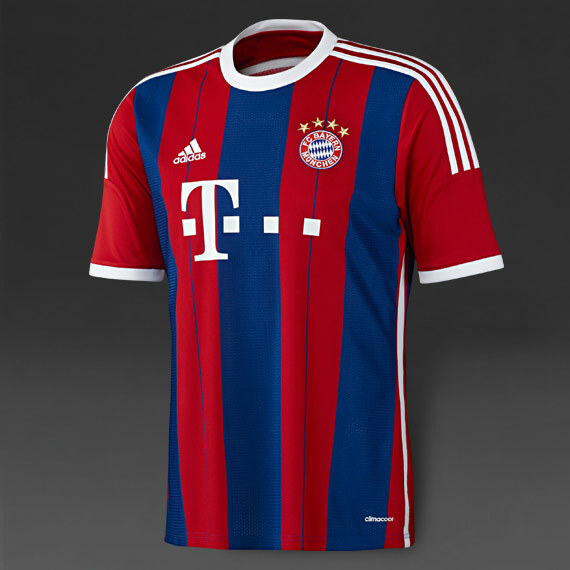 The 2014/15 campaign saw the return of the blue and red vertical stripes. White was used as the accent color on the ring collar, stripes on the shoulders, cuffs and down the torso. An all red kit was present for the 2015/16 season as adidas used a darker red on the collar, brand markings, cuffs and waist to complement the traditional red. The 2016/17 shirt is all red with horizontal stripes of a very subtle contrasting red, a full collar with red buttons on a white plaquet. Where the club and adidas go from here is anyone’s guess. I would love to see the white shirt with either maroon trim or sleeves. Thinking Arsenal’s away shirt from 2007/08. 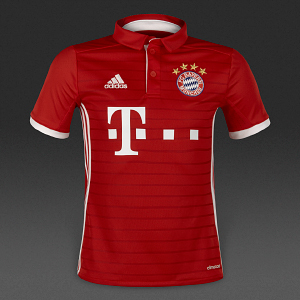 Anyway, I hope you have enjoyed this look at Bayern Munich home shirts. I learned a lot about the club and found some really interesting designs. Special thanks to Denis Hurley of Museum of Jerseys for his help on this project.